Luang Prabang, the former capital of Laos, is the center of culture and religion of Laotian people with monasteries, monuments, etc...This 4 days tour in Luang Prabang allows you to experience mainly parts of this lovely city. On arrival at the airport, you will be met and transferred to your hotel. Time permitting; your half day city tour begins with a visit to the Royal Palace Museum, which hosts a range of interesting artifacts. We then head to the magnificent Wat Xiengthong with its roofs sweeping low to the ground, which represents classical Laotian architecture. We also have time to visit the impressive stupa of Wat Visoun and the shrines of Wat Aham and Wat Mai. Today we embark on a cruise upstream on the Mekong River, firstly stopping at Xiengmene, where we visit Wat Long Khun, and the limestone cave Tham Sakkarin, and tour around Ban Xiengmene village. 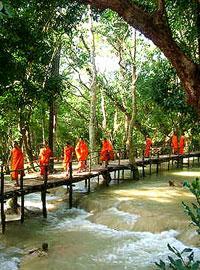 Following a picnic lunch, we then continue by boat up the Mekong which also gives us a breathtaking view of the tranquil countryside as well time to explore the mysterious Pak Ou Caves, two linked caves crammed with thousands of gold lacquered Buddha statues of various shapes and sizes left by pilgrims. Along the way, we stop at the village of Ban Xanghai, where they make the local rice wine. On return, we take a short drive to Ban Phanom, a small village known for its hand weaving. Today we cross the Mekong River by boat, to the picturesque village of Ban Chan, a pottery village. We then visit the morning Phousi Market, where you will see such diverse offerings as dried buffalo skin, local tea and saltpeter among the chickens, vegetables and hill-tribe weavings. Laos is also known for its traditional crafts, and today you will visit local villages of Lao ethnic minority groups at Ban Ouay, a Hmong village, Ban Ou a Laoloum village and Ban Thapene, a Khmu villages. This then takes us to the beautiful Khuang Si Waterfall where you can cool off with a refreshing swim in the pools or walk along the forest trails. We then return to Luang Prabang by late afternoon. Depending on your flight, you may have time at leisure before the transfer to the airport for your flight to the next destination.